Happy Friday, blog family! 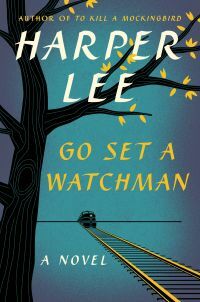 As July came to an end, I began something new: the recently published Go Set A Watchman by the author of To Kill A Mockingbird, Harper Lee. I first read To Kill A Mockingbird, like most people, in high school. Maybe I’m the only one, but I really didn’t care for it. My issue with the book is that it’s a great character study, and it has a very interesting, historically accurate plot, but the writing style seemed slow to me. Granted, I haven’t read the book in years but I do remember that I wasn’t crazy about it. My favorite part of the entire book was the trial and that only lasted a little bit. Nevertheless, I heard that Harper Lee had just gotten a new book published. A sequel to To Kill A Mockingbird set 20 years after the trial. After some research I actually learned that the book was found in Harper Lee’s safety deposit box, and was written as the first draft of a manuscript of To Kill A Mockingbird. Lee decided that she would keep the book in safe keeping, but she began writing the book we’ve all read from the beginning. She made the characters she’d first created younger, and went into a lot of detail about the postbellum South (and particularly the justice system when it came to black people in the south). Well, after going to Costco and seeing that the usually $30 book was only $15, I decided to read it. I had finished The Martian and wanted to read something shorter that I thought would be an interesting read. I was wrong. At least for a while, I was wrong. You see the book starts out really really really slow. The first exactly one hundred pages (out of 279, by the way) were slow. No, not slow, boring. Maybe it’s the fact that I’ve been reading books that are all excitement from page one, but this book was really boring. But for a couple days I figured that I might just be feeling this way because I didn’t like the first book. Then it dawned on me that I was really only reading this book because I felt I needed to. I felt obligated to read this book because it was written by somebody incredibly well known, and it was her first published book since the original back in 1960. It was something I had chosen to read, but not because I thought the story sounded interesting. Still, I kept reading. On page 104 the book got somewhat interesting. Or, at least, at page 104 a plot appeared. Honestly, the second the plot appeared I couldn’t put it down. I’ve mentioned how recently I’ve been reading very slowly. Well, from page 104 to 279, it took me a total of 3 hours, over the span of two days, to read the rest of the book. Which is great considering I’ve been reading about ten pages a night, if that. I thought that was very well said. It’s quite true that looking back on your life you’ll think of what you should have done and how naïve you were. It’s so easy to think those things. It’s so easy to get lost in the past. But what is in the past is past. It’s much harder to look at yourself and understand who you are now. It’s something that so many people struggle with. This isn’t a spoiler because it’s on the back cover of the book, so don’t blame me: Atticus is super sick! He’s been declining for a long time. In fact, he’s been declining for years. And guess how long it’s been since Jean Louise saw him? TWO YEARS. TWO. Come on, Scout. Dr. Finch (AKA Uncle Jack). I don’t actually remember if this man was in the first book or not, but oh. my. god. I love him. I wish I could follow Dr. Finch around for 279 pages instead of Jean Louise because this man is so brilliant. He’s such a great character and has so much to contribute. In fact, that quote I mentioned a few paragraphs ago, that was said by Dr. Finch. He was wonderful. Okay, so last thoughts. The book was alright. In a way I’m glad I read it, but I also wish I hadn’t read it, just because I would have gotten to leave the characters eternally where I left them: as kids. I understand peoples desire to read this book and learn more about the future of the Finch family, but I wasn’t crazy about that. HOWEVER, had this book not been affiliated with To Kill A Mockingbird at all, and had just been a new book about a girl who visits her hometown for a couple weeks, I think this would’ve been a pretty decent book. But because it had those ties to the characters everyone knew and loved and kept in their memory, it kind of ruined it a little bit for me. Had Harper Lee changed the names of the characters and changed the name of the town, this could’ve taken place anywhere in the South and it would have been an interesting read towards the end. If you loved the first book, chances are you’ll like this one too. It has a lot of the same things: writing style, characters, message, etc. It just wasn’t for me. If you’ve read it and liked it, or didn’t like it, let me know in the comments or send me an e-mail at rachel@booksandcleverness.com and we can have a conversation about what we thought!